This is a masterly narrative of the land of Israel from 70 to 640 CE by an eminent Israeli historian. It is a comprehensive record of Jewish life under Roman rule: economic conditions and social welfare; Jewish law and courts; political repression and resistance; religious controversies; the Diaspora and relations between the national center in Palestine and the communities abroad. Gedaliah Alon describes the rebuilding of national life after the defeat in 70; the emergence of the Sages as community leaders; the extent of autonomy under the Roman Empire; the towns and cities of Jewish Palestine; armed uprisings and the Bar Kokhba Revolt; the decades of decline and large-scale emigration; the traditions of learning that produced the Mishnah and Talmud. It is a rich, vividly told story. 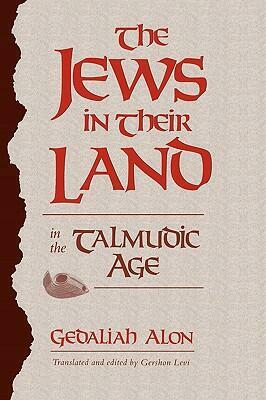 This paperback reproduces in one volume the two-volume translation of Alon's classic work published in Jerusalem in 1980 and 1984.